Aspects such as the style of the housing, the available space or the number of users must be taken into consideration. Gamadecor, Krion, L’Antic Colonial and Noken offer designs which meet any atmosphere and necessity. Choosing different types of furniture depends on each user’s personal taste and the bathroom typology itself. The space available, the decorative style or the materials for easy maintenance are just some of the aspects to bear in mind. 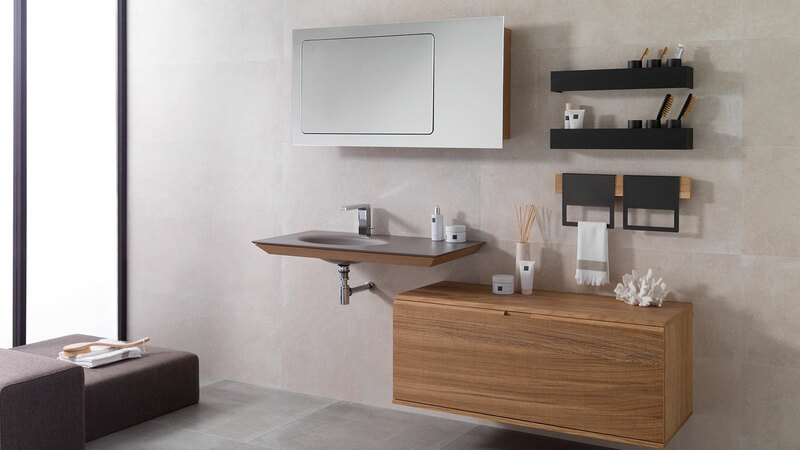 Through its equipment firms, the PORCELANOSA Grupo offers different bathroom furniture designs and formats which meet each necessity. Minimal pieces which enhance the storage capacity, everyday comfort and practicality. One of the issues that users must think about when it comes to choosing a piece of furniture is how many people will use it. 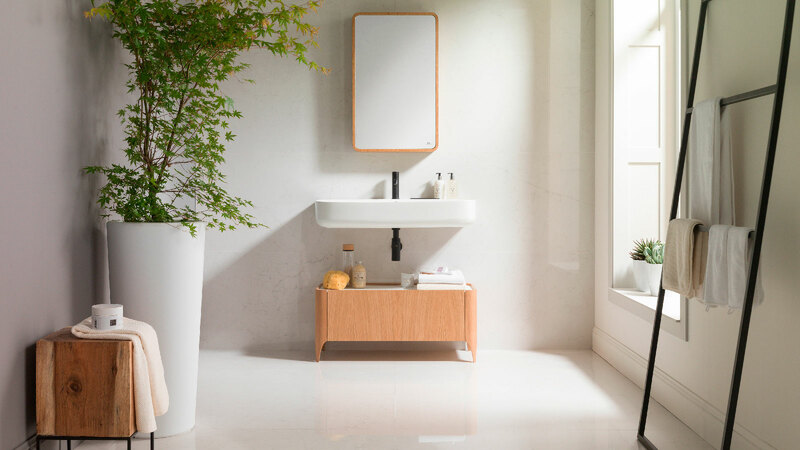 The Karon collection by L’Antic Colonial is available in: a basin, floor-standing or concealed; or in the two floor-standing basins version, so that two people can use them simultaneously. Manufactured with walnut wood with the Intense or Warm finishes, this piece of furniture offers a warm minimal design in two different wood tones and with one or two drawer units. The available space affects the choice of the bathroom furniture. Trends in interior design suggest dynamic formats which allow for greater customisation. 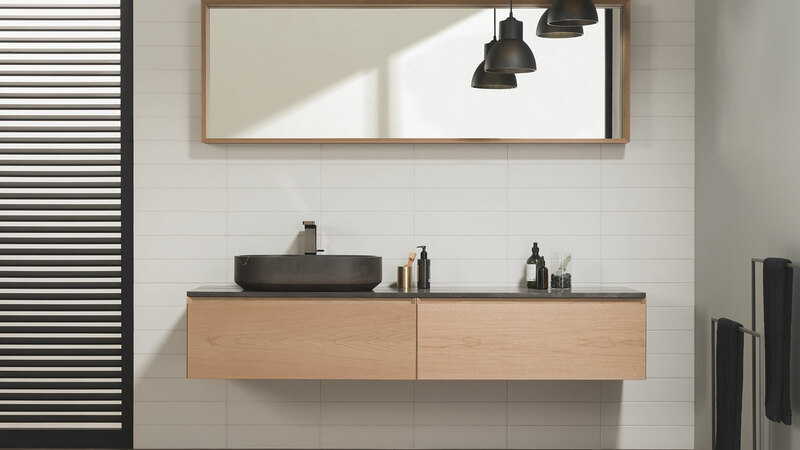 Mertens by Gamadecor combines the balance and proportions in a set which includes a wall-hung basin, furniture, a mirror and bathroom accessories in a modular arrangement. 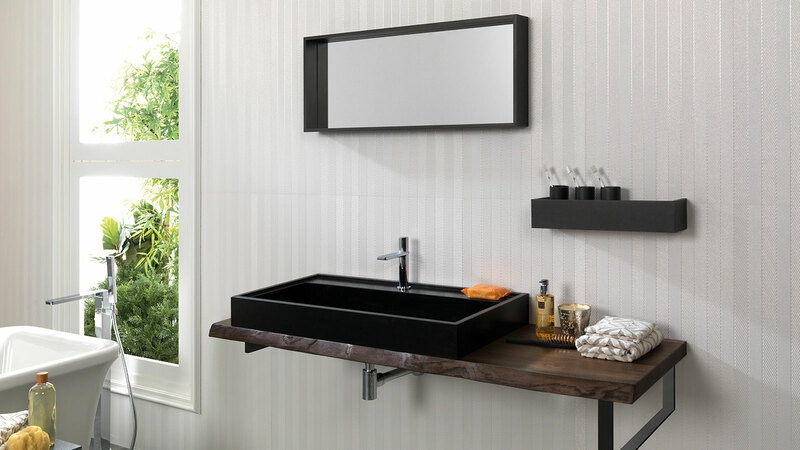 Elements created in oakwood and black matt metal which boost the visual cleanliness, enhancing both the order and the storage. Bathroom furniture must have a harmonious design that goes with the rest of the house. The Nordic style is a trend, as well as the classical-renovated lines matching the floor and wall tiles. 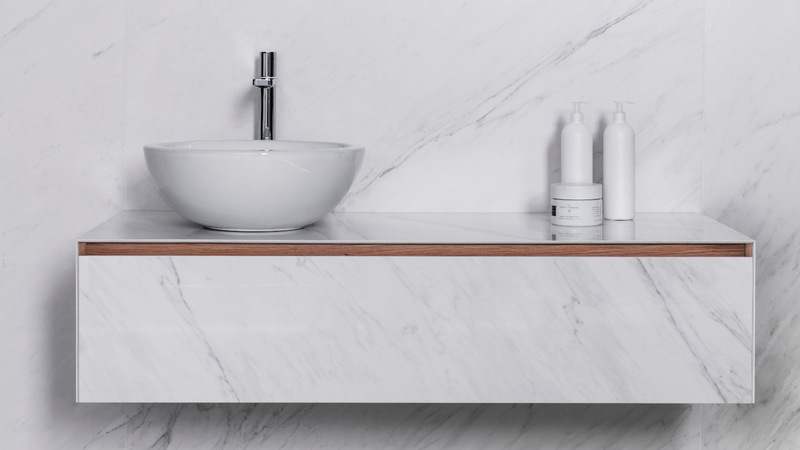 Tiles from Noken Porcelanosa Bathrooms reproduce the essence of classical marble through its Xlight wall tiles from Urbatek. In the 80cm and 120cm formats, this wall-hung module offers great support surface and a spacious drawer unit for storage. 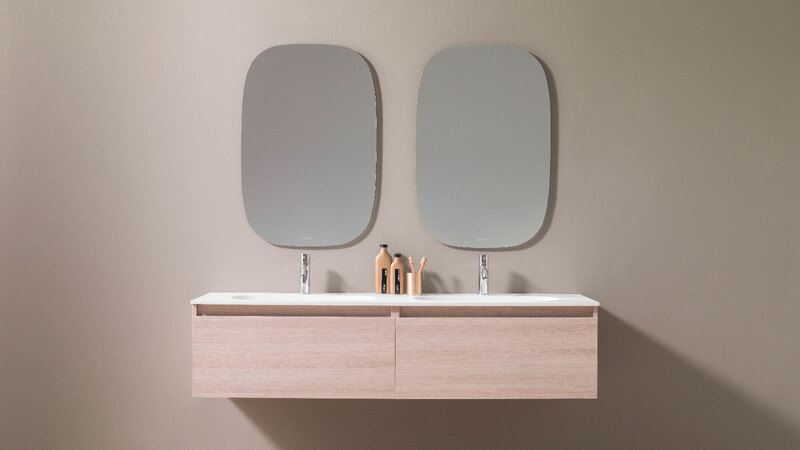 Another strong commitment by Noken is the Nature collection, which conveys Scandinavian warmth and serenity with a furniture set in natural oakwood and a mirror with hidden cabinet. The signature designs, along with their creators’ seal, come together with the quality of the PORCELANOSA Grupo, and an example of this is the Minim Wood series from L’Antic Colonial in which Ramón Esteve is inspired by the origin of rocks and natural wood in order to focus on the concept of minimalism. Wall-hung elements stand for spaciousness and width, with a floor-standing version as well. 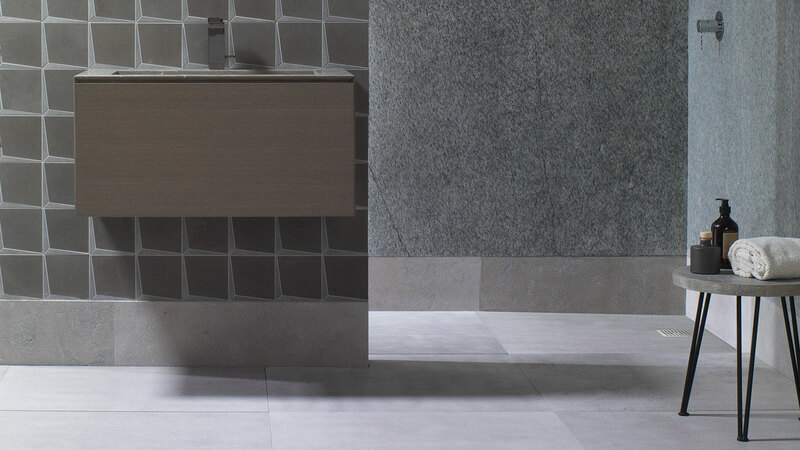 Because of its numerous technical features, the KRIONTM mineral compact is the ideal material to use in the bathroom. Krion offers two pieces of furniture manufactured with this Solid Surface, ensuring their durability, easy maintenance and cleaning. The Nest countertops show soft asymmetrical lines with a depth of 50cm. The bowl, also asymmetrical, can incorporate one or two taps. As for the complements, the collection includes several modular options: wall-hung furniture, floor-standing metallic frame with a shelf and mirrors with a light and an anti-fog system. The Smart series consists of a countertop manufactured with KRIONTM and wooden wall-hung furniture. It can be independent or with spacious removable drawers which can be single or double in taupe oakwood or ash oak. The Smart version with a metallic frame includes a shelf for storage. Last but not least, the Wood Roble Bronze series from Gamadecor shows the imperfections and veining of natural wood in wall-hung module with a floor-standing basin. All of this with the resistance and the special treatment which is required in a wet atmosphere. The storage capacity through spacious drawer units or cabinet-mirrors is very important for everyday life. 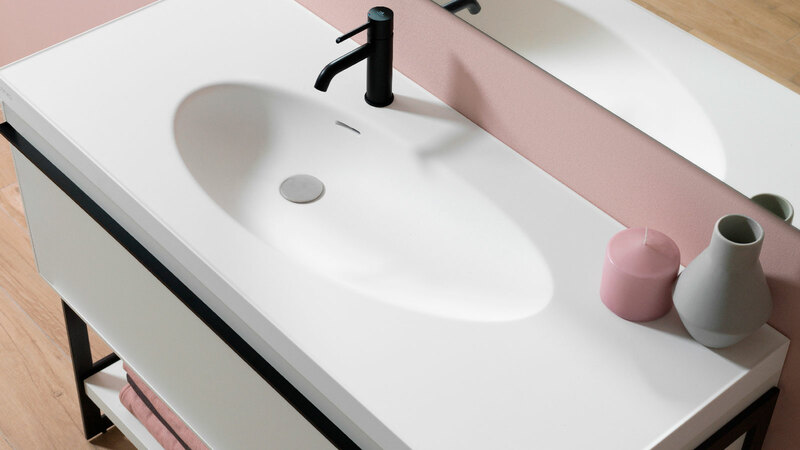 The order inside is vital for the everyday use and the support surface and the basin are becoming more and more important. Practical designs specifically intended to make people’s lives that much better.